He walked in through our front door. But it wasn’t easy for him. Daniel had lost both of his legs in a recent surgery. He was still learning to navigate on two prostheses. 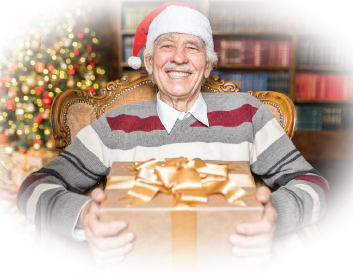 As cheerful as he tried to be, this big-hearted grandfather was still struggling. He had always been self-sufficient – but now he was having trouble with the basics: housekeeping, doing laundry, preparing meals. Meanwhile, every day, there were close calls – near-falls, time and time again, because he didn’t have adequate medical equipment in his bathroom. But he didn’t have the money to get what he needed. Yet worst of all was the roommate situation. Daniel’s antagonistic housemate refused to clean up after his dog – turning Daniel’s life into a toxic nightmare of multiple infections. But somehow, Daniel emerged from this hostile, unhealthy world to help find and hope … here at FSL … thanks to you. Your generosity opened our door to him, welcomed him warmly, and began a journey of compassion. With your strong support, we cared. But it was more than just care. It was care by design. Our Care by Design director, Simon, visited Daniel’s home personally. Simon was well prepared to thoroughly and professionally assess the situation. He quickly arranged the most urgently needed help first: immediate housekeeping services. Simon was able to act without delay, thanks to our Care by Design fund. But this was only the beginning. Simon rushed to purchase a shower chair – essential equipment for a double amputee. Finally, Daniel could bathe safely … for the first time since his surgery! Next Simon connected Daniel to free home-delivered meals – one every day – to get his nutritional levels back in order. Last but not least, he reached out to local law enforcement … and Daniel’s abusive roommate was removed permanently from the home. Daniel’s life has been beautifully transformed. Not just through care … but through Care by Design. Today, Daniel is living in a clean, safe home. He has access to healthy meals. He’s building up his strength, improving his own mobility, moving back toward a place of self-sufficiency, a renewed independence. This might have been a miserable Christmas for Daniel … but instead, it’s going to be a day of real hope, real joy. All because of someone he may never meet … you. Thanks to your compassionate and faithful support of FSL, we were able to tune in to Daniel’s specific, unique needs, and help meet each one with a carefully individualized plan of action. Not a “one size fits all” response … but a care by design. A wonderful, meaningful, life-changing Christmas gift! As Christmas approaches, an elderly person, here in our community, will be sinking into despair … grappling with difficulties, feeling alone … desperately needing help and hope. You can give the beautiful gift of care by design!